Tonight marks the beginning of the Dark Half of the year, and to the Celts, it is known as Samhain. When the holiday was Christianized, we began to celebrate it as Halloween…. The meaning of the this night and the day that follows has changed little over the centuries. 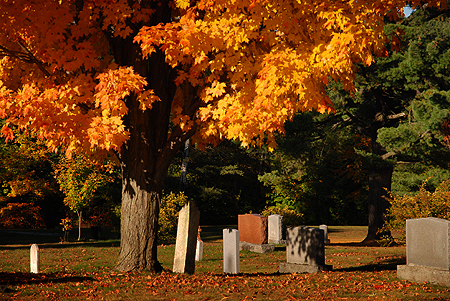 Our concept and understanding of Death, however, has transformed. In spite of its pagan origins, Halloween has been well adopted and is still celebrated widely in Europe, Mexico and in North America. One thing that all that celebrate have in common is that this night brings with it the thinning of the boundary between worlds – our world and the world of our ancestors, the spirits. “Samhain” (sow-ihn) is Old Irish and means, roughly, ‘summer’s end’. The pre-Christian Celts would light a bonfire after the harvest had been brought in. While it burned, all other hearth fires in the village would be extinguished. The bonfire became the source of the new hearth fires as it was common to all the villagers. The fire also signified the light that would hold off the dark and cold of Winter. The practice of divination was also common on this night because the veil between worlds was thin. Most often the issues divined involved future lovers. The Western window of the house was left open as an invitation to family members lost over the year. For the Celts, it was also the celebration of the new year. These fires have been lit through the centuries and continue on the British Iles today. El Día de los Muertos — the Day of the Dead, is celebrated in Mexico from midnight on the 31st of October until the second of November. Symbols of death pervade the streets, however, it is not a celebration of fear, but rather, the celebration of those that have died. Altars honouring their memory are erected and feasts are held. As our culture has moved away from the land, we seem to have also lost our understanding of Death and the source of this and many of our traditions that celebrate and acknowledge the Cycle of Life. We fear Death, put it away in hospitals and try everything possible to avoid age – the precursor if we are lucky – even at the expense of our health. The dark stories of our ancestors are sanitized for our children and we promote this illusion that we are somehow protecting them from the evils of the world which include Death itself. We shield them as long as we can, instead of allowing them to see their place in the world and come to understand it. We cannot teach what we do not know ourselves. Even in the earliest days of Christianity, in the mystic tradition that survived through the Renaissance and into our own time, there has been an acceptance of the dual nature of the Universe. Underlying this duality is an unknowable Unity achieved only through direct experience after great contemplation and meditation. Most of us born into the Christian tradition know so little about it and few likely realize that some traditions we see as uniquely Eastern or ancient, exist in our own culture, if we just look deeply enough. So what does this have to do with Death and All Hallow’s Eve? As our ancestors that lived close to the land knew, Death is a natural and necessary part of Life. If we embrace it, we have the opportunity to live more fully. If we celebrate it, we can value it subtle gifts such as the Autumn colour and the return of the Light in Spring. Most of all, we can value the exquisite gift of Time with those that we love while they are with us and revel in their memory when they have passed on. The faces on the wall of grandma’s house are our own… Is that not worth celebrating? I see the death is a normal thing. I will die someday later or sooner. I just made my day the best coz I don’t know if I have tomorrow. This is a wonderful post Michelle. I love your blog. I think this is one of the best blog posts I’ve ever read. What a great and poignant piece. Misty Moon at Midnight is beautiful as well as intriguing. Joey – Thanks for visiting! Thanks, Linda! I am so glad that you enjoy it…. Wow, Kinsey – That is quite a compliment! I am glad that it touched you. I have been trying to find a way to say it for a while now…. Interesting that these are our thoughts as we celebrate the second most anticipated Christian holiday. As we all and or our children travel around on this All Hallow’s Eve, “incognito” .. perhaps we should wonder why we so enjoy, even for just a little while, wondering around in a disguise. Is it those pictures on Gramma’s wall that are haunting us ..? or is it us looking back at ourselves..? Dang…Wordpress errored out on me & lost my comment! The only thing I held fast to when I left the pagan label behind was Samhain. As you’ve noted, modern, Western views of life & death are a bit skewed. We have prospered to the point where (generally speaking,) we don’t have to fear starving through the Winter. Perhaps our sense of security has made us complacent. Lovely photo & beautiful painting! Lana – I hope not too complacent. Perhaps that is why we are more ‘depressed’ as a society? This is so fabulous and breath taking. And the lyric in the song goes right true my heart,,,Thank you for sharing. I’m late as usual, but the moonlight painting is beautiful. 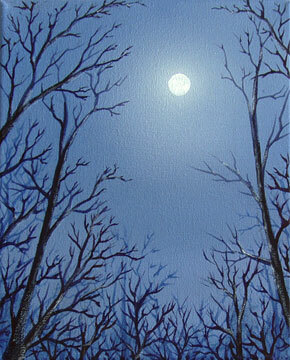 It is just such I moon that I saw on my walk last night, sky laced with trees. Thanks for showing it.